The OHL All-Stars took a surprising outburst in the third period to seal the first win, and an all-around team effort in Game 2 to complete the sweep. The best and brightest of the Ontario Hockey League took on the Russians in the ADT Canada-Russia challenge this week, and the OHL came away with two hard-fought wins. The Russians began their trip across North America -- a six-game tour against all-star teams from each of the three CHL-member leagues -- in Chicoutimi and Gatineau, Quebec, and stole three of a possible four points from the Quebec Major Junior Hockey League all-stars. The OHL All-Stars proved to be less hospitable. But it took a surprising outburst in the third period to seal the first win, and an all-around team effort in Game 2 to complete the sweep. The Russians roared out with two goals in the first 10 minutes of Game 1, before Wayne Simmons of the Owen Sound Attack and Josh Bailey of the Windsor Spitfires responded for the OHL. The second period was also an even affair, with Kingston Frontenac Cory Emmerton, a Detroit Red Wing prospect, lighting the lamp for the OHL. Then, in the third period with the score tied 3-3, the OHL exploded for two goals in 27 seconds, and the Russians were never able to regain control of the game. Oshawa Generals forward Dale Mitchell was credited with the game-winning goal while Nick Spaling of the Kitchener Rangers added the insurance goal. Oshawa Generals forward John Tavares had three assists in the first game, and finished with a goal in the second game for a total of four points. 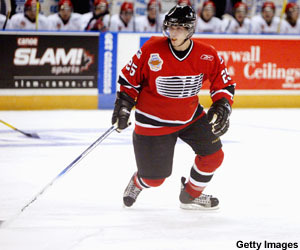 He was named the OHL’s Most Valuable Player in Game 1. In the second game, it was Florida Panthers prospect and the OHL’s fourth-leading scorer, Shawn Matthias, who led the team with a goal and an assist as the OHL defeated the Russians, 4-2. Now, the Russians travel to Cranbrook B.C., for a game against the Western Hockey League All-Stars on Nov. 28 before wrapping up the 2007 ADT Canada-Russia challenge in Medicine Hat, Alberta, on Nov. 29. Around the OHL -- Goaltender Jeremy Smith was named the Boston Pizza Player of the Week for the period ending Nov. 25, as he posted one shutout, a 1.33 GAA and a .964 save percentage in wins against Saginaw, Sault Ste. Marie and Sudbury. Smith currently sits third in the league in GAA with a 2.50 mark in 15 starts, and leads the OHL in save percentage with an impressive .933 percentage. … Kitchener Rangers forward Justin Azevedo had a five-point night this week, in a 6-3 victory against Sarnia. Azevedo scored three goals and added two assists in the game, and then followed that performance up with a goal and an assist in an 8-4 defeat of the Erie Otters the following evening. Azevedo’s four-goal, three-assist week pushed him up the OHL scoring race to second overall, behind only John Tavares. Azevedo’s total of 37 assists is tops in the OHL. … Brett MacLean, a second-round pick of the Phoenix Coyotes in 2007, scored twice Friday in a 6-5 shootout loss to the London Knights, and then added another goal Sunday in a 3-1 defeat of the Brampton Battalion. MacLean has now scored at least one goal in each of his last 11 games, and has averaged two goals per game during that stretch, posting a staggering 22 goals and eight assists for 30 points in only 11 games. Chicago Steel forward Andy Miele currently sits tied for the league-lead in USHL scoring, due to an itchy trigger finger that has seen him score 18 goals in his first 17 games of 2007-08. With a seven-point outburst in three games this week, he now sits with 26 points through 17 games, tied with John Kemp of the Indiana Ice, who has five goals and 21 assists through his first 16 games. Miele began the week with a goal and an assists in an 8-3 win against Green Bay. He skated to a plus-2 rating and recorded four shots, notching a point in his third consecutive game. He topped that performance in grand style Friday night, scoring four goals on four shots in a 10-3 defeat of the Indiana Ice. In addition to an assist (for five points on the evening), and a plus-3 rating, Miele also recorded 12 PIMs in the contest. Miele will skate for the Miami (Ohio) RedHawks of the CCHA next season. The RedHawks are currently ranked No. 1 in the nation. Around the USHL -- How do you feel if you’re Andy Miele? Miele scores four goals in a game and records seven points as his team wins two of three games, and he doesn’t get the RBK Offensive Player of the Week honors. That title went to teammate Drew Leblanc, who also scored five goals in the three games but added four assists for a total of nine points. He was plus-4 for the week. … With 19 goals scored in three games, you expect the Chicago Steel forwards to enjoy themselves, but a defenseman got into the act as well. Will Weber earned the CCM Defensive Player of the Week honors with a goal and two assists, a plus-5 rating and seven shots in the three games. … Sioux Falls goaltender Eric Hartzell won all three of his starts this week, knocking off the top two teams in the West Division. He posted a 3.00 GAA and a .917 save percentage in wins against Omaha, Sioux City, and Des Moines. Halifax Mooseheads forward Tomas Knotek and Quebec Remparts forward Mikael Stefanovich may be rookies in name, but the two European-born skaters are playing like seasoned veterans in the QMJHL this season. Knotek, of Kladno, Czech Republic, has 11 goals and 34 points in 28 games, pacing the 2007-08 QMJHL rookie class by four points over Stefanovich, a Minsk, Belarus native who has 15 goals and 30 points on the season. Both Stefanovich and Knotek are highly ranked skaters in the recent CSS QMJHL preliminary rankings, with Stefanovich sitting atop the draft-eligible skaters and Knotek sitting in the top 20. Around the QMJHL --Gatineau Olympiques forward Matthew Pistilli earned the TELUS Offensive Player of the Week for the period ending Nov. 25, as the winger scored a goal and added four assists in wins against Moncton and Val-d’Or. He now sits fourth in overall QMJHL scoring with 41 points in 30 games and his Olympiques sit atop the TELUS division standings. … Shawinigan defenseman Simon Lacroix was named the TELUS Defensive Player of the Week during that same stretch, as the seventh-round pick of the New York Islanders in 2007 scored twice and added two assists for four points in two games. Shawinigan won both of its games during the week, defeating Moncton and Acadie-Bathurst. The Edmonton Oil Kings were the only team to mar the recent hot streak of the Lethbridge Hurricanes, so it seemed only fitting that they would also be the team to end the streak, when the Hurricanes finally ran out of luck. The Oil Kings defeated the Hurricanes 6-3 on Nov. 21, marking the end of an incredible 14-game run in which Lethbridge was able to take 27 out of a possible 28 points, and remain undefeated in regulation for more than a month. The previous game between the two teams, a 4-3 shootout win by the Oil Kings, was the single point Lethbridge failed to acquire during its run. But all credit to the Hurricanes who suffered a shutout at the hands of the Vancouver Giants in the next game and still bounced back to gain a measure of revenge against the Oil Kings, defeating them 3-2 on Nov. 24 in front of Lethbridge's home fans. The Hurricanes currently sit two points behind the Calgary Hitmen for first in the Central Division. Around the WHL --The WHL is a tough place for rookies. Brandon Wheat Kings forward Brayden Schenn, with 24 points in 27 games this season, is the top-ranked rookie scorer in the league and sits 43rd in league scoring. He is the only rookie in the top 50 in WHL scoring, and leads the rookie class by two points over Tri-City Americans forward Johnny Lazo. By comparison, the top-ranked rookie scorer in the OHL, Patrick Maroon of the London Knights, has 34 points in 23 games, good for 21st in the league, and Tomas Knotek of the Mooseheads has 34 points in 28 games and sits tied for 13th in league scoring.